For users of LiveLink™ for Revit®, COMSOL Multiphysics® software version 5.3 brings improvements when synchronizing your Revit® project with COMSOL Multiphysics® and extends support to new versions of certain CAD file formats. Read more about the LiveLink™ for Revit® updates below. 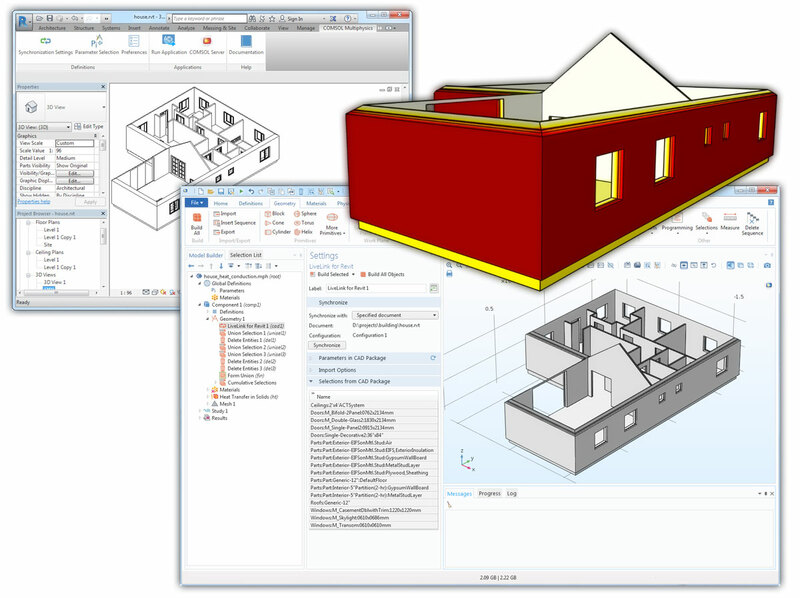 It is no longer required that room definitions exist in the Revit® project or that the synchronized elements belong to a room in order to synchronize geometries between the Revit® software and the COMSOL Multiphysics® software via LiveLink™ for Revit®. This improved functionality also expands the type of elements that can be synchronized to include, for example, wall layers, structural framing and foundation elements, as well as mechanical and electrical equipment. Additionally, selections that can be used to more easily define simulation settings in COMSOL Multiphysics® are automatically generated for the synchronized elements. When synchronized between the Revit® software and the COMSOL Multiphysics® software, the geometry of the walls of this house can now include the wall layers, as defined by the wall types in the Revit® project. The selections generated for layers and other elements are displayed in the Settings window for the LiveLink™ for Revit® interface. The plot shows the temperature distribution from a heat conduction study of the synchronized structure, where the presence of the wall layers on the heat flux is evident. Autodesk, the Autodesk logo, Inventor, and Revit are registered trademarks or trademarks of Autodesk, Inc., and/or its subsidiaries and/or affiliates in the USA and/or other countries. ACIS is a registered trademark of Spatial Corporation. Parasolid and NX are trademarks or registered trademarks of Siemens Product Lifecycle Management Software Inc. or its subsidiaries in the United States and in other countries. SOLIDWORKS is a registered trademark of Dassault Systèmes SOLIDWORKS Corp. COMSOL AB and its subsidiaries and products are not affiliated with, endorsed by, sponsored by, or supported by these trademark owners.